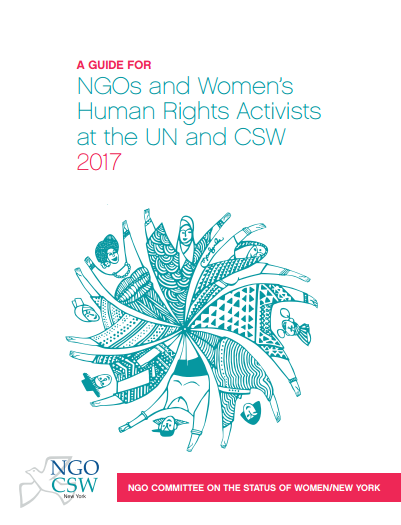 The NGO CSW/NY is proud to announce the Advocacy Guide for 2017 (CSW61) on “NGOs and Women’s Human Rights Activists at the UN and CSW 2017”, which contains a new chapter on the Sustainable Development Goals (SDGs). The guide includes knowledge on and around CSW, advocacy toolkits, and a fun Quiz! WEDO will participate as a global trainer in the CSW61 Advocacy Trainings in Negotiations and Women’s Human Rights next month. WEDO will work alongside regional trainers and partners to facilitate the training during the first sessions of the Asia Pacific, Latin America & Caribbean and North America & Europe caucuses. This is a continuation of the WEDO’s work and contributions to the NGO CSW/NY training manual as well as to the regional advocacy/training sessions during the Beijing+20 preparatory meetings in the regions. At CSW61, participants will come away with an understanding of the CSW process generally and CSW61 in particular, as well as tools and strategies to be effective partners and advocates in UN negotiations about women’s human rights.